(B&H Academic 2012, $32.99), Stuart Scott and Heath lambert, eds. “The Bible isn’t a scientific text book, right?” Such a statement carries the commonly held notion that because the Bible speaks primarily to theological and spiritual matters — in pre-modern, non-scientific language — it does not provide the church with resources sufficient to handle the problems con- temporary American society sees best left to secular professionals. 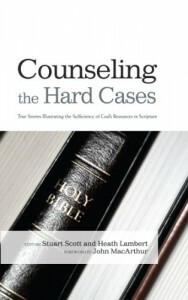 In the volume Counseling the Hard Cases, editors and Southern Seminary professors Stuart Scott and Heath Lambert seek to disprove this notion both in theory and by example, demonstrating Scripture’s competency to speak to the most difficult and complex problems, which they contend are theological at heart. “Biblical counselors have argued that Scripture is comprehensive. Scripture does not contain every last bit of information that can be known. Scripture contains all things that bring the counseling task into focus like a pair of glasses. Scripture is relevant to the counseling task like a compass that reorients every problem,” writes Lambert in the book’s introduction (emphasis original). In the introduction, Lambert sets forth the book’s purpose and addresses the issues related to the ongoing discussion between biblical counselors and those who represent the Christian counseling, integrationist and Christian psychology movements. The 10 remaining chapters each present accounts of how biblical counselors were able to help, admonish, correct and encourage those struggling with difficult and complex problems. “These arguments have persuaded our contributing authors (and many others) that Scripture is comprehensively sufficient to do ministry with people experiencing profound difficulties in their lives,” writes Lambert in the books introduction. “The purpose of this book is vigorously to highlight the resources in Scripture. We are also compelled to drive home the high calling and sacrificial commitment to love people,” write Scott and Lambert in the book’s conclusion.